Although the Stars confirmed last week that a transaction to sell the team was imminent, it wasn't until today that it was confirmed by the USHL, and the new ownership named. Click here to read the official announcement from the USHL. Click here to read the announcement from the Lincoln Stars. The new ownership group is 823 Ventures LLC, which consists of Ryan Schiff and his wife Kirsten Schiff. 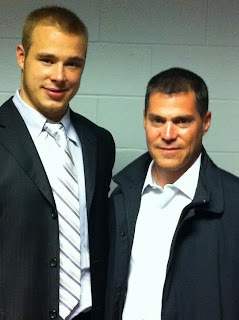 Ryan Schiff is pictured on the left with L.A. Kings forward Dustin Brown. Schiff works for "ED&F Man Capital Markets" in Chicago, Ill where he is the Global Head of Foreign Exchange. Click here to view his Linkedin profile. He is also the CEO and Founder of "POSTGAME," which is a company that sells shampoo/body wash that is marketed towards athletes. Click here to read more about POSTGAME. According to their website, USHL teams such as the Indiana Ice and the Chicago Steel use POSTGAME in their locker rooms. The Columbus Blue Jackets and the Pittsburgh Penguins also use POSTGAME. Schiff played two years of college hockey at the University of Miami-Ohio, and one year of minor-pro hockey. Click here to view his EliteProspects.com profile. From what I was told, Schiff was in attendance last Thursday evening at the IceBox and watched the Chicago Steel-Lincoln Stars game in which the Stars lost 5-1. Very exciting times for sure. It's nice to know Schiff is committed to keeping the Stars in Lincoln. It will be interesting to see what changes he makes, and how soon he makes them. Thoughts on this big news? Comments are wide open. I'd love to hear your thoughts. Yeti, Do you know how much money the team was bought for? Just curious. No, I do not know what the final purchase price was. I heard a rumor, but I don't feel comfortable posting it here on this blog. Needless to say the number I heard was A LOT. It is great to hear the team isn't going anywhere. Hopefully the new group makes some changes soon before the team sinks any further in the standings. Uh-isn't last place about as far as you can sink in the standings? I do know the number and it was a lot. Ryan is a great guy with a true passion for the game. He wants to be a part of the game that will allow for players to develop and become successful in the direction that the game takes them. He is a business man with a true grasp on what it takes to be on top. I know that he wants nothing but success in his endeavors and is willing to grow a business from the ground up or turn around a failing product to reach its true potential. He is a hands on leader but will always delegate to whom he feels will provide the best results. Good luck Lincoln with the 2015-16 season. I expect to see Ryan with an NHL team in the future!